Ever since the company was founded, we have sought to provide our customers with the highest quality – and we continue to pursue this goal today. Our products are 100% Made in Germany, using durable and high-quality components. Not only does this help us keep transport routes short and protect the environment, but also boosts the German economy. Our work is characterised by careful planning, absolute process reliability, documented specialist knowledge and transparency in all areas of the business. 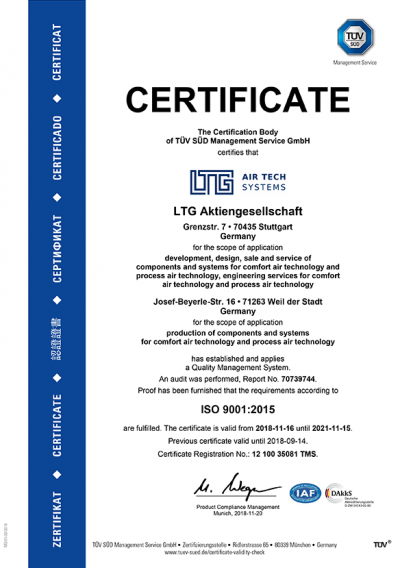 Our compliance with defined processes is confirmed regularly by auditors TÜV Süd, and we have been certified to DIN EN ISO 9001:2015 for many years. At LTG, our commitment to sustainability and environmental protection goes beyond production. Our customers use our air-conditioning and process air solutions to meet tough requirements in modern buildings, or for creating ideal conditions for their production processes. Our innovative and energy-efficient technologies help minimise both energy consumption and material usage. LTG components and systems stand out thanks to their high energy efficiency and durability, making them the perfect choice for fulfilling both economic and ecological requirements.